If you won’t have many opportunities to kayak in Southern Vermont this summer, why not choose a rare body of water? The 200-acre Sadawga Lake is said to be named for Chief Sadawga, the last American Indian to camp on its shore, and rumor has it he could swim under its floating bog-like island. A cormorant spreads its wings — a common sight along the coast, but a often problematic nester in freshwater ponds and lakes in Vermont. Today, the island is a roughly a quarter of the reported size, and a few years ago friends Tony Costello of Pittsfield and and Laura-Lee Alfonso of Richmond joined me for a late summer visit. We found a well-kept launching area owned and maintained by Vermont Fish and Wildlife. The many summer homes along the shore and the lack of rest rooms were at first a disappointment; before long though, our paddling brought us farther from civilization, and with the sounds of nature our attitude changed. The secluded island and its convoluted passages and smaller islands became a delight to explore. We kept on the lookout for insect-eating plants like the sundew and pitcher plant and soon found both. This pond is the remnants of a bog with its insect-eating plants. 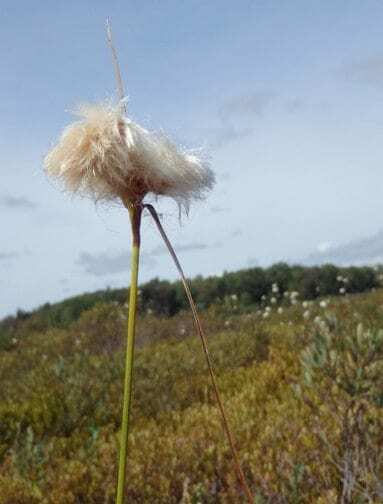 And as we paddled about, we found many other surprises — two kinds of cranberries laden with fruit yet to ripen, sheep and bog laurel, and cotton grass or bog cotton, a native sedge that at this season through Autumn has seed heads that resemble tufts of cotton. The yellow flowers of common bladderwort emerge from the water surrounding the mat. Bladderwort itself has developed special traps for capturing tiny swimming water animals. And at this end of the lake we saw little sign of humanity. We slowly approached a great blue heron intent on swallowing a just-caught fish while kingfishers were calling in the background and a double-crested cormorant that nested here earlier flew low over the open water and stopped long enough for a portrait. Dragonflies were everywhere, and I was determined to land at the island to explore. I carefully got out of my kayak and even more carefully made my way across the island, photographing its many species of plants. For safety, I carried my paddle in the event I fell through the mat, which I didn’t. Early reports have described the island floating around the lake with tamarack trees acting as sails. The tamaracks or American larch, are still there, though I suspect that the island, a floating sphagnum mat, is stationary now, anchored by tree roots. Directions: From North Adams, take Route 8 north to Route 8/100 north; continue past Readsboro, and when you start of seeing Harriman Reservoir on left, look for Sadawga Lake Road on right. Image at the top: Tamarac is a coniferous and deciduous tree that turns bright yeallow before dropping its needles in the Autumn. All photos by Thom Smith.